As I understand it, the Security/EarthForce relationship was a little awkward; some of Security were EarthForce personnel and some weren't. But yes, Sheridan was still in charge, even if Franklin outranked him. Garibaldi is a policeman not a soldier so generals are not authorised to give him and his men orders. Sheridan may be a military officer but he is also governor of Babylon 5. It is the post of Governor that can give orders to Garibaldi. Having said that refusing a request for a man able to give orders to you boss is inadvisable. Having just watched this episode, Garibaldi is an officer in EarthForce, if a General gives him an order he will follow it and they are well within their right to do so. Look back at the episode Eyes, he has to answer to the orders given to him by a Colonel because Garibaldi falls into the military chain of command and in turn his security officers will do whatever he tells them to do and he will tell them to do whatever a higher ranking officer tells him to tell them to do. On Babylon 5 Garibaldi does nor wear a soldier's uniform. He wears a security uniform. It is after Eyes that Garibaldi determined his chain of command. Except Garibaldi's uniform is distinctly different from the rest of B5 Security: it has the leather panel, and the EA insignia. But every time we stick our head into this "B5 ranks/chain of command" stuff, we end up arguing, because it's not perfectly internally consistent and it doesn't match any real comparable system we have today. Garibaldi is a Non-Commissioned Officer with the rank of 'Chief Warrant Officer'. According to what I'm reading, the Warrant Officer has all the authority and responsibilities of a commissioned officer, but restricted to a single speciality or discipline. In this case, Security. Warrant officers are placed in authority over enlisted personnel, but answerable to senior officers. It would explain why his uniform is a variant of the security grey. On the topic of the episode itself though, I just got done watching this a little while ago, and I loved it. I loved the camraderie that formed between Keffer and the two GROPOS, and felt the sorrow when they found out their fates at the end of the episode. I can't wait for 'Day of the Dead' in Season 5 now. 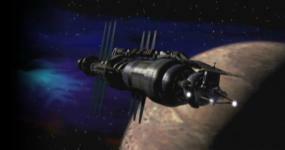 Babylon 5 was last of the Babylon stations. There would never be another. It changed the future and it changed us. It taught us that we have to create the future or others will do it for us. It showed us that we have to care for one other, because if we don't, who will? And that true strength sometimes comes from the most unlikely of places. Mostly, though I think it gave us hope that there can always be new beginnings, even for people like us. Keffer standing there at the end reacting to the casualty list was probably the character's most dramatic moment in the entire show, let alone in the episode. He wears the uniform of an EF Officer, as the chief warrant officer he is a part of the chain of command. While B5's chain of command may be murky, it is never in question that Garibaldi is an officer in EF and that he is answerable to all the same military protocol as any other officer. Cell loop up what an NCO is. I know exactly what an NCO is, and based on the fact that for the most part EF appears to operate under the same ranks as the present day US Armed Forces, Garibaldi would actually be a commissioned officer since he is the Chief Warrant Officer on B5. In the US Armed Forces a chief warrant officer, and that is what Garibaldi is, isn't a non-commissioned officer but rather a commissioned officer. Even if Garibaldi were a NCO, he would still be within the chain of command and therefore wouldn't be a civilian in any way. He would be answerable to any superiors in rank, and when told to be at ease, he certainly wouldn't be putting his hands in his pockets. He would also follow all orders from superior officers, he does this in Eyes, and he does this all the time when he takes orders from Ivanova, Sheridan and Sinclair. If any other officer of a superior rank were on station he would also take orders from them, because that is what NCO's or CO's do. Overall the episode is average so I give it a B, but I always liked the ending of this episode for some reason. I guess it's just the thought that the person you could be sitting next to one minute can be dead the next day. There is a greater darkness than the one we fight. It is the darkness of the soul that has lost its way. The war we fight is not against powers and principalities, it is against chaos and despair. Greater than the death of flesh is the death of hope, the death of dreams.